This is the fifth Dragon Quest game I’ve reviewed in 2014, and by now I’m sure I’ve hammered in the significance of this series to the JRPG genre, if nothing else. After starting the year with Dragon Quest 8 ($19.99), one of the more recent and certainly the most technologically advanced installments in the series, we took an odd side path to Dragon Quest 4 ($14.99) before heading back to the beginning of the series. I’m a firm believer that Dragon Quest games are like pie in that there’s no bad one, but the first two games require a certain understanding of the context in which they were released to fully enjoy them. They’re very much formative works of the genre, and as such have all kinds of prickly bits and loose ends hanging off of them. 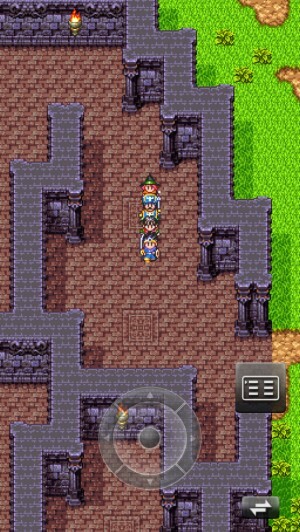 Dragon Quest 3 ($9.99) is where that proviso can be safely removed. I mean, if you want to consider when it released, feel free to do so. It came out in Japan in February of 1988, mere months after the first Final Fantasy ($7.99), and it blew the doors off of the Japanese game market. This is the game that spawned the widely-believed urban legend about the Japanese government banning Enix from releasing Dragon Quest games on weekdays due to masses of people skipping work or school to pick it up. While it was a joking suggestion rather than an actual signed law, Enix never did release a mainline Dragon Quest game on a weekday in Japan again, bucking the usual release trends in the country. Dragon Quest 3 is where the series went from being merely successful to being a cultural phenomenon in Japan, a status it still holds in the present day. Meanwhile, in North America, we were still more than a year away from getting even the first Dragon Quest ($2.99), and wouldn’t see Dragon Quest 3 until June of 1991, a mere two months before the Super Nintendo launched. While that wasn’t quite as dire a situation as its follow-up would face, it’s safe to say that the hearts and minds of gamers were perhaps focused elsewhere at the time. As a result, the game didn’t receive quite as much attention as it deserved, though those that found it generally spoke very highly of it. Personally, I missed the game at its release, but picked up a battered rental copy from a video store several months later. I remember one of my friends wondering why I had dusted off the NES again when there were so many newer, cooler games to play, but even with the limited experience of my 12-year old mind, I knew that Dragon Quest 3, or I suppose Dragon Warrior 3 at that time, was something special. I didn’t actually beat it then, though I tinkered endlessly with the many party options and got a good bit into the game before something else caught my eye. North America’s next chance would come a decade later, in July of 2001. In the intervening years, Japan had received Super Famicom remakes of the first three Dragon Quest games, but Enix America’s temporary closure during the 16-bit period meant English gamers missed out. With the establishment of a new American subsidiary in 1999, Dragon Quest made its return to Western shores via the Dragon Warrior 1 & 2 collection for the Game Boy and Game Boy Color. These were what might be called ‘demakes’, taking the many improvements and advancements the Super Famicom remakes offered and recreating the games with the limited hardware capabilities of the Game Boy. The next year, Enix followed up with a Game Boy Color-only version of Dragon Warrior 3, another ‘demake’ that actually piled more content on top of the 16-bit remake. Once again, however, its timing in America was poor, as its release followed only a few months after that of the Game Boy Advance’s launch. Two more passed over rereleases take us to the present day, where Dragon Quest 3 is finally releasing in English to hardware that is both active and not likely to be immediately rendered obsolete. 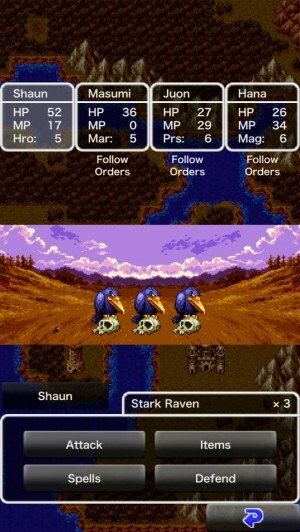 This version of the game, as with Dragon Quest 1 and Dragon Quest 2 ($4.99), is based on a Japan-only feature phone release from 2009, which itself was based on the Super Famicom remake from 1995. This means a few things for the port. First of all, this is the best-looking version of the game English gamers have had officially available to them. As an added bonus, the stretched pixel problem of the iOS versions of the first two games has been corrected here. Everything looks sharp, colorful, and detailed. It also sounds better than ever, going well beyond even the 16-bit version. The iconic 8-bit sound effects are set against gorgeous orchestral renditions of the game’s soundtrack. Less happily, it also means that there is less content than the Game Boy Color version of the game, which added a bonus dungeon that isn’t present here. Also gone are the collectible monster medals that were the requirement for entering that bonus dungeon. The remaining bonus dungeon, first seen in the Super Famicom version, is still here, as are most of the additions to that remake, such as collectible mini-medals that can be traded for powerful items. That said, some things have been cut from even that version. The opening cut-scene featuring the hero’s father Ortega is gone, and so is the dice game. I presume the former was due to memory restraints on the feature phones of the time, while I’m not sure about the latter. The special items you would normally find in the dice game have been redistributed to the mini-medal collection, so you at least won’t miss out on the rewards. Also unfortunately absent are the monster animations, which I’d guess were also cut for memory reasons, since even the Game Boy Color version had them. Granted, the original NES version didn’t have monster animations, but it’s still sad to see them gone given how pretty they are in the games that have them. Even with the cuts that it’s taken to its extras, Dragon Quest 3‘s core is so strong that it’s still a fantastic experience. The main quest has you taking the role of the child of a brave hero, picking up his quest where he left off after disappearing some time ago. Rather than filling out your party with distinct characters, you’ll create your own band of fellows at the local tavern, choosing up to three to take with you in your active party. 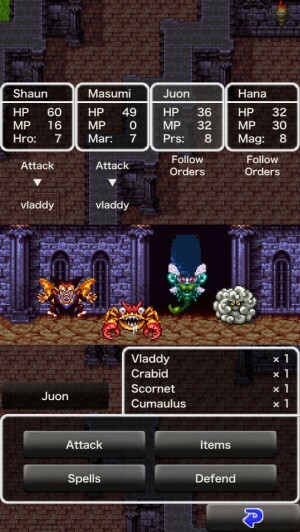 While your hero’s job class is fixed, your party members can take on one of seven different classes. Even better, at a certain point in the game, you can change their classes, bringing all of their earned benefits from their previous class to their new one. It’s entirely possible to create a party of tiny gods and goddesses if you feel like putting the time in, though most players would be wise to stick to sensible combinations like priest/warrior or mage/priest for their first run through the game. After putting your band together, you’ll travel a suspiciously familiar world, solving local problems and searching for clues to the whereabouts of the Archfiend Baramos, the monster behind most of the current ills plaguing the world, and more personally, your father’s disappearance. It’s a huge quest, and I imagine most will see the north side of 25 hours on the clock by the time it’s all wrapped up. The story’s far from deep, even by the Dragon Quest series’s humble standards, but there are plenty of interesting events along the way, such as a lazy king who seems a bit too eager to get out of his line of work, or the amusingly predictable outcome of the settler town. 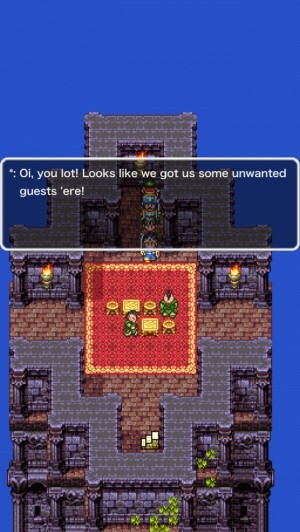 Dragon Quest 3 also features what is probably the best use of game-to-game continuity in the series. You don’t need to play the first two games to enjoy this one, but you’ll get a lot more out of it if you have. This game’s connections to the earlier two titles are probably the strongest reason to play those games in modern times, to be honest. In terms of mechanics, there’s not a whole lot different here compared to Dragon Quest 2 outside of the class change system, but the little changes it does make are quite welcome. Among the additions are the bag which makes inventory management problems a thing of the past, the ability to switch out party members freely at the tavern, and a day/night cycle which you’ll have to make use of in order to explore everything fully. Like the second game, Dragon Quest 3 becomes non-linear to an extent at a certain point in the game, allowing you to pursue the objects you need in any order you see fit. The battle system also features a wider range of buffs and debuffs, calling for more interesting strategies if you want to win against some of the devastating bosses you’ll come across. You really need to pay attention to those skills from this game forward in the series unless you want to grind the difficulty away instead. 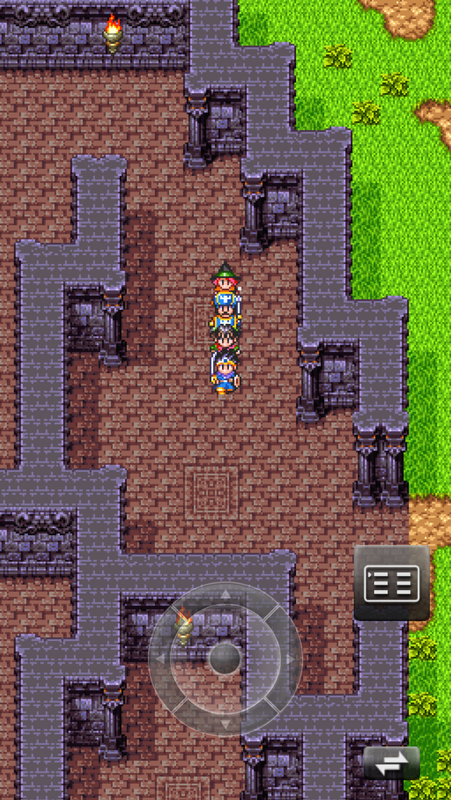 As with the other recent ports to iOS, Dragon Quest 3 is only playable in portrait orientation, and while it wears that well, I know many out there would like a landscape option. I doubt it’s in the cards for any of these games, unfortunately, but it’s still worth mentioning it every time. Options are good things, after all. The game uses the same interface as the others in the series, and offers similar saving options to make it friendlier for the mobile lifestyle. Also as in prior ports, there’s no support for Game Center or MFi controllers here. There is one new addition to this version, and that’s the ability to set your party members to AI control. The AI isn’t too bad, with lots of preset behaviors to choose from, but I really couldn’t see playing that way unless I was just grinding for kicks or something. That said, while this port probably could have been better in various ways, it’s still an excellent game all around. I could knock it for its minor failings, but the bottom line is still one of the best JRPGs available on mobiles, and any RPG fan should jump on it without hesitation. It’s also a great place to start if you’re new to the series, since it represents the point of which the series grew out of its rough, hesitant beginnings and as a result still holds up very well 26 years later. It might seem a little pricey given its 8-bit origins, but I can promise you that when you’re coming out the other end of Dragon Quest 3, you’ll feel like every penny was well-spent.